I’ll keep my contribution here short and sweet — very interesting. The U.S. Department of Energy has awarded $122 million to establish a research center in California to develop ways of generating fuel made from sunlight. The project will be led by researchers at Caltech and the Lawrence Berkeley National Laboratory, and will include researchers at various other California institutions, including Stanford University, the University of California, Irvine, and the University of California, Berkeley. Sun-soaked silicon: Researchers at the new Joint Center for Artificial Photosynthesis will work to optimize light-trapping silicon microwires, like these, to produce fuel from solar energy. And a giant leap for content producers (like myself, for instance.) The freelance writing world has been in crisis for a long while now, in part because of high unemployment. Anyone who’s taken freshman composition in college can suddenly declare themselves a freelance writer. The problem is you have to have clips to get work for the most part, and the easiest way to get clips is to work for nothing, or almost nothing, and go from there. Couple that dynamic with the internet’s need for content and unscrupulous business people who are more than happy to exploit people who want to write and you find a situation where companies are literally offering a penny-a-word or less for so-called SEO internet content. For writers, good luck on even finding the one-time bargain basement dollar-per-word rate for marketing communications. My current rates are down and my client list is a lot smaller than even a couple of years ago. Glad to see there’s some push back against this trend from places that might actually make a difference — search engines. And if you’re looking at getting into freelance writing, I strongly, strongly urge you to avoid Demand Media, Suite 101, and the other content mills out there who are only going to exploit your talents, not pay you an even remotely a fair wage, and in the end leave with with clips that almost any legitimate media outlet will reject as more than worthless. Gabriel Weinberg, creator of upstart search engine Duck Duck Go (DDG), says that some time ago users requested that he remove from results from eHow.com. The site is owned by Demand Media, a $200 million a year “content farm” that produces 4,000 articles a day by playing freelance writers to churn out articles at bargain basement rates, based on what people are searching for and how much ads those search terms are worth. Knowing little about the site and the discussions swirling around the quality (or lack thereof) of its content, Weinberg wasn’t moved to act on those requests until he discovered evidence that Demand Media, which owns eHow.com, was buying up domains for legitimate businesses and redirecting them to their own content. “It pushed me over the edge,” says Weinberg. Via KurzweilAI.net — just the facts, ma’am. The Institute for the Future (IFTF) has launched a new contest called BodyShock The Future to develop innovative ways to improve individual and collective health over the next 3-10 years by transforming our bodies and lifestyles. IFTF is looking for visual ideas — video or graphical entries illustrating new ideas, designs, products, technologies, and concepts. Entries will be accepted from people around the world until September 1, 2010. Up to five winners will be flown to Palo Alto, California on October 8 to present their ideas and be connected to other innovative thinkers to help bring these ideas to life. The grand prize winner will receive the IFTF Roy Amara Prize of $3,000. “Entries may come from anyone anywhere and could include subjects such as Life extension, DIY Bio, Diabetic teenagers, Developing countries, Green health, Augmented reality, Self-tracking, and Pervasive games,” IFTF Research Affiliate Alexandra Carmichael, who is heading up the project, told KurzweilAI. “Examples might be engineering beneficial bacteria that can help boost human immunity, or a treadmill that shows a preview of your future self to motivate you to exercise. Basically some kind of technology design that can improve health in the future. Judges include Joanne Andreadis, Lead of Innovation, Centers for Disease Control and Prevention; David Rosenman, Director, Innovation Curriculum, Center for Innovation at Mayo Clinic; Ted Eytan, MD, Kaiser Permanente, The Permanente Federation; and Jason Bobe, Director of Community, Personal Genome Project, and Founder, DIYBio.org. Due to my recent light blogging schedule this is not hot from the inbox, but it come through early yesterday morning. Pretty cool accomplishment, I’d say. (http://www.qinetiq.com/home_farnborough_airshow/unmanned_air_systems/zephyr.html), its solar powered high-altitude long endurance (HALE) Unmanned Air System (UAS) back to earth after two weeks in the air – smashing a number of long-standing official and unofficial world records. Zephyr was launched on 09 July and is currently still flying above the US Army’s Yuma Proving Ground in Arizona. Today Zephyr will have been aloft for 14 nights continuously, achieving the objective of the trial and setting a number of performance and altitude records. At this point QinetiQ’s Zephyr team in Yuma will bring the aircraft back to earth. An official from the Federation Aeronautique Internationale (FAI) (http://www.fai.org/), the world air sports federation, has been monitoring progress at the Yuma Proving Ground and when Zephyr is back on the ground he looks set to be able to confirm a number of new world records. This includes quadrupling its own unofficial world record for longest duration unmanned flight (82 hours, 37 minutes set in 2008) and surpassing the current official world record for the longest flight for an unmanned air system (set at 30 hours 24 minutes by Northrop Grumman’s RQ-4A Global Hawk on 22 March 2001). Zephyr will also have flown longer, non-stop and without refuelling, than any other aeroplane – having significantly passed the Rutan Voyager milestone of 9 days (216 hours) 3 minutes and 44 seconds airborne, set in December 1986. Easy to transport in a standard road transport container, once launched Zephyr can remain above a general area for weeks, if not months, at a time delivering vital capability at a fraction of the cost of satellites and significantly more cost effectively than other ‘conventionally powered’ manned or unmanned aircraft. Zephyr also does not need to return to base at regular intervals for re-fuelling or servicing which helps minimise the logistical supply chain, extending its operational capability and appeal. Its zero emissions also make it exceptionally environmentally friendly. For the trial in Yuma Zephyr is carrying a communications payload configured to meet the needs of the UK Ministry of Defence. In addition to the obvious defence and security applications, commercial uses include environmental research; monitoring crops and pollution; providing tactical intelligence over disaster zones or forest fires; plus delivering mobile communications capabilities in remote areas. Chris Kelleher, QinetiQ’s chief designer said: “We have designed, built and delivered what will be remembered as a milestone in aviation history. Zephyr will transform the delivery of current services such as communications, and lead to many new applications which are not possible or affordable by other means. “The brand-new ‘production ready’ Zephyr airframe incorporates totally new approaches to aerodynamics, structures, propulsion, avionics, flight controls, power system management, thermal control, ground control station design and payload, as well as overall operating processes. Our outstanding team has brought this entire ‘one-shot’ flight together at the first time of asking, demonstrating we can operate both the aircraft and its ultra-light utility payload routinely for long duration flights. Launched by hand, the aircraft flies by day on solar power delivered by amorphous silicon solar arrays, supplied by Uni-Solar (http://www.uni-solar.com/), no thicker than sheets of paper that cover the aircraft’s wings. These are also used to recharge the lithium-sulphur batteries, supplied by Sion Power Inc (http://www.sionpower.com/), which are used to power the aircraft by night. Together they provide an extremely high power to weight ratio on a continuous day/night cycle, thereby delivering persistent on station capabilities. … it probably is. I will have to admit, if this tech is the least bit feasible it would be something of a climate issue miracle. By using the sun’s visible light and heat to power an electrolysis cell that captures and converts carbon dioxide from the air, a new technique could impressively clean the atmosphere and produce fuel feedstock at the same time. 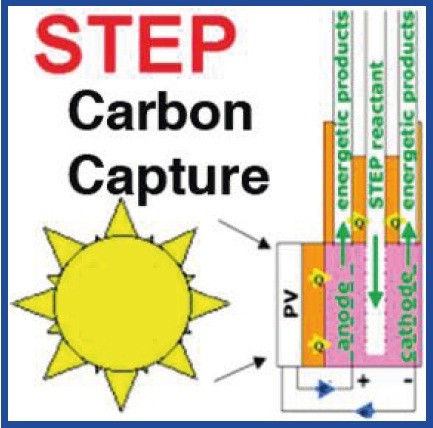 The key advantage of the new solar carbon capture process is that it simultaneously uses the solar visible and solar thermal components, whereas the latter is usually regarded as detrimental due to the degradation that heat causes to photovoltaic materials. However, the new method uses the sun’s heat to convert more solar energy into carbon than either photovoltaic or solar thermal processes alone. Don’t you just love some of the stuff that comes out of the upcoming Black Hat conference? I can understand pointing out issues with web security — particularly at the enterprise level — but announcing a hack to break into home routers in wide use, and here’s the especially bad part, releasing a tool to automate the hack so the usual gang of fools and script kiddies don’t even have to work at it. I think we all know who/what the real tool is here. An engineer from security firm Seismic claims he will soon release instructions on how to hack millions of wireless routers commonly used in residential Internet connections. The how-to hack instructions are part of what has become an annual chest-beating by speakers at the Black Hat security conference that hype their keynotes with end-of-PC-security-as-we-know-it promises. Ars Technica reports that the presentation, entitled “How to Hack Millions of Routers” (not mincing any words there, are they? ), will be given at Black Hat by Senior Security Engineer for Seismic Craig Heffner. Heffner’s presentation will include a live demonstration on how to “pop a remote root shell on Verizon (VZ) FIOS routers” as well as a tool release that will automate the described attack. Seismic has tested around 30 routers so far, and has found that approximately half of them are vulnerable to this attack. The list of vulnerable routers includes routers from Linksys, Belkin, ActionTec, ASUS, Thompson, and Dell (DELL). Via KurzweilAI.net — this is the first I’ve heard of this Federal Trade Commission proposal. As you can imagine, I don’t like it at all. The Federal Trade Commission’s proposed “hot news doctrine” — legislation that would prevent others from reporting the same facts as a traditional publisher for a period of time after a news event — “would not only hurt free expression … [but] make it virtually impossible for aggregators such as Google News and Yahoo News to function the way they currently do, publishing excerpts from news stories without explicit permission from media outlets,” Google public policy director Pablo Chavez said. The “hot news doctrine” would also partially cripple KurzweilAI’s news coverage. – Ed. Nanocoatings do a lot of good, particularly with making solar cells more efficient. The trick is they haven’t been too easy to apply to big areas. Researchers at Stanford have helped change that issue. The first beneficiaries of quantum computing? Chemists. Who’d a thunk that one. It’s not totally there yet, but quantum chemistry may transform the field. 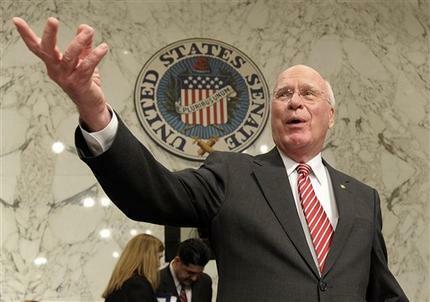 … to 60s vintage hippies as the neocon movement was to post-WWII pinkos. This document outlines a method of creating carbon nanotubes that doesn’t require high temperature or pressure. This potentially will dramtically lower the cost of manufacturing carbon nanotubes. We develop a new chemical route to carbon nanotubes at room temperature. Graphite powder was immersed in a mixed solution of nitric and sulphuric acid with potassium chloride. After heating the solution up to 70 and leaving them in the air for 3 days, we obtained carbon nanotube bundles. The process could readily give an easy way of preparing carbon nanotubes without high temperature and high pressure. We develop a new chemical route to carbon nanotubes at room temperature. Graphite powderwas immersed in a mixed solution of nitric and sulphuric acid with potassium chloride. 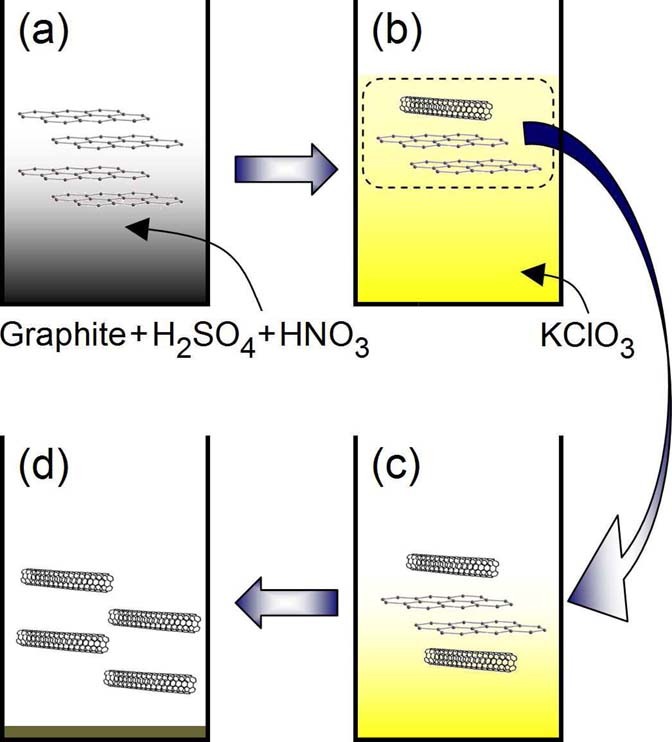 After heatingthe solution up to 70 and leaving them in the air for 3 days, we obtained carbon nanotube bundles.The process could readily give an easy way of preparing carbon nanotubes without high temperatureand high pressure. In summary, we have presented a simple chemical method for producing CNTs in liquid solution at 70 without any pressure treatment. The CNTs form bundles containing crystalized and multi-walled single CNTs with a diameter of around 14.6nm. The electron diffraction patterns demonstrate its zigzag edge structure. We expect this new synthesizing method may produce cheap CNTs and as a result open an easy access to the industrial device based on CNTs. FIG. 1: (a) mixture of graphite, sulfuric acid (H2SO4, and nitric acid (HNO3). (b) potassium chlorate (KClO3) was put in the solution. (c) floating carbons produced from the pro- cess (b) were transferred into DI water. (d) the sample was dried after filtration. The process (b) and (c) were repeated 4 times. FIG. 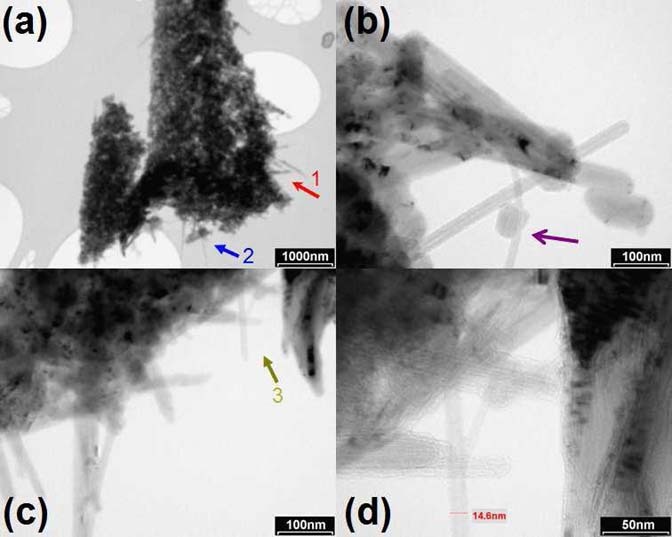 3: (a) transmission electron microscope (TEM) images of CMT bundles. Panels (b) and (c) magnificently present the regions pointed by number 1 and 2 in panel (a), respectively. A single CNT noticed by an arrow in panel (b) proves CNT’s flexibility. (d) the enlarged region of panel (c) (arrow 3), revealing a multi-walled nanotube with a diameter of 14.6nm. For more on the actual trial, here’s a Reason article from today. Did the FCC actually do something good here? I’m pretty suspicious of government activity by default because all too often something that sounds both reasonable and sensible turns out to have a dank underbelly that undermines anything good in the action. Keeping that in mind this move by the Federal Communications Commission actually sounds like a good idea. Hard to believe I just typed that line. The Federal Communications Commission (FCC) voted unanimously today to initiate a Notice of Inquiry (NOI) seeking comment on easing restrictions and paving the way for satellite spectrum to be used for land-based mobile broadband service. The move would be a significant step toward freeing up the 500 MHz of spectrum bandwidth by 2020 to meet growing wireless broadband needs. The FCC proposes to change the rules for how satellite companies are allowed to use the Mobile Satellite Services (MSS) airwaves they control to spur more innovation in delivering mobile broadband spectrum. A second proposal from the FCC would allow satellite companies to relinquish MSS spectrum in exchange for a return of the profit when those airwaves are auctioned off. FCC commissioner Michael Copps explains in a statement “As demands for speed and mobility increase, so does the demand for spectrum upon which mobile wireless broadband rides. Unfortunately, we can’t make any more spectrum, so we need to find ways to optimize our supply by expanding flexibility of use for licensees and improving efficiency through new and innovative technologies. The current king of spam, its malware employs a kernel-mode rootkit, inserts random text into spam and is capable of TLS encryption. Concentrates solely on pharmaceutical spam. A long-running botnet that has had its ups and downs, owing to the attention it attracts from researchers. Concentrates mostly on pharmaceutical spam. A newer spambot that employs a kernel mode rootkit and is often installed alongside Pushdo on the same host. A multi-faceted botnet or botnets, with many different types of campaigns. A major distributor of malware downloaders and blended threat e-mails, but also sends pharma, replica, diploma and other types of spam. Also employs a kernel-level rootkit. A wide range of spamming templates changes often, served up by multiple Web servers. Mostly pharma spam. The malware acts as a proxy by relaying SMTP from a remote server to its destination. Mostly pharma and replica spam. Another long-running botnet that employs sophisticated methods to locate its command servers. Mostly pharma spam. The name derives from an earlier mass-mailing worm. Nowadays, Bagle variants act as proxies for data, and especially spam. By default, uses a proxy-based spam engine. However, it may also use a template-based spam engine if the bot runs behind a network router. Focuses on Casino spam. Donbot is named after the string “don” found in the malware body. Mainly pharma spam. I always love covering news that combines solar and nanotechnology, particularly when the combo leads to lower costs for solar power. I’ve previously blogged about nanopillars leading increased solar efficiency. Carbon nanotubes really are an amazing material. IMAGE: Submarines of the future could be equipped with “nanotube speakers ” to help improve sonar to probe the ocean depths and make the vessels invisible to enemies. Via KurzweilAI.net — regular exercise provides many, many benefits and it’s not surprising improved mental health is among them. Since you’re reading this in front of a computer, take a few minutes sometime today to at least go on a brisk walk. Personally I do a bit of physical exercise, but nothing like I did when I was much younger. Now I completely swear by a 30 minute to hour daily workout on the Wii Fit Plus . For some reason I enjoy the idea of having a virtual trainer guiding my workout. It has something of “the future has arrived” science-fictiony feel to it for me. Exercise can ameliorate anxiety and depression-like behaviors induced by an adverse early-life environment by altering the chemistry of the hippocampus, the part of the brain that regulates stress responses, researchers from the University of New South Wales (UNSW) have found. In the study, rats were divided into groups and either isolated from their mothers for controlled periods of time to induce stress or given normal maternal contact. Half were given access to a running wheel. In addition to being more anxious, animals that were subjected to stress early in life had higher levels of stress hormones and fewer steroid receptors in the part of the brain controlling behaviour. “Both the anxious behaviour and the levels of hormones in these rats were reversed with access to the exercise wheel,” said UNSW Professor of Pharmacology Margaret Morris. “We know that exercise can elevate mood, but here we are seeing chemical changes that may underpin this improvement. One of these is increases in brain-derived neurotrophic factor (BDNF), which helps nerve cells grow. “Many neurological diseases appear to have their origins early in life. Stress hormones affect the way nerve cells grow in the brain. This discovery may be giving us a clue about a different way to tackle a range of conditions that affect mood and behaviour,” she said. Here’s the PhysOrg take on this story.